Lynn and I just got back from San Sebastian Spain and we are still feeling the impact this region's food culture had upon us. One of our favorite breakfast places was Old Town Coffee about a 20 minute walk from our Hotel. 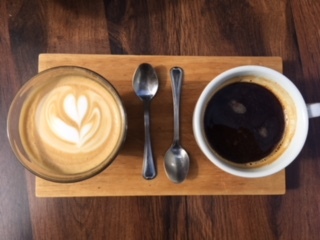 Lynn loved her fragrant Latte and my Americano was strong enough to help me shake off at least some of the jet lag from our trip from JFK to Madrid. 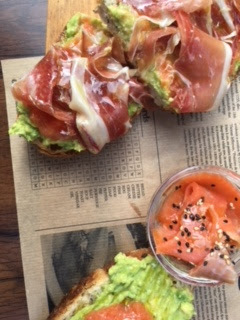 We kept things simple for the most part sticking with our drinks and the delicious tostadas topped with next level avocado and juicy Spanish ham (jamon). The young couple there were attractive and accommodating. We were immensely appreciative of this great, warm venue to reset our selves.